With a head carried proudly and adorned by a lionlike ruff, a distinctive blue tongue and an overall teddy bearlike appearance, the chow chow breed certainly boasts some impressive looks. However, when it comes to the health department, things may not be that pretty. This breed is prone to some serious health issues, and breathing problems are among them. Becoming aware of these problems is key to recognizing early signs of trouble. The history of this breed of Asian descent remains for a good part wrapped in mystery. This ancient breed had a reputation for being a versatile companion. Whether he was hunting, herding, guarding temples or pulling carts, he proved his worth as a powerful all-purpose dog. Mother Nature equipped him with a well-insulated coat to withstand the cold weather of his homeland. Being a Nordic breed with a heavy coat, it's important not to let him get too hot; chows are prone to developing breathing difficulties in warm weather. The American Kennel Club's standard for this breed describes the chow's head as large compared to the size of the body with a broad, flat skull and a short, deep muzzle. Dog breeds sharing facial features characterized by pushed in or short faces are classified as brachycephalic, a term deriving from the Greek word "brachy" meaning short and "cephalic" meaning head. The American Kennel Club Canine Health Foundation lists the chow as a breed affected by brachycephalic respiratory syndrome. 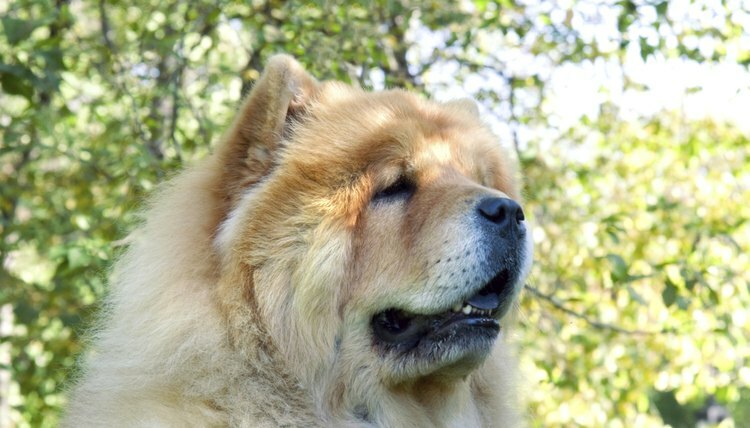 Because of the chow's shorter bones, the relationship with the other soft tissue structures are altered, making this breed prone to breathing problems. Being aware of these altered soft-tissue structures is important for chow owners. Brachycephalic respiratory syndrome may include an elongated palate, excessive skin at the back of the mouth that falls loosely into the throat, partially obstructing the chow's airway during breathing. Breathing can be further impaired by the presence of narrowed nostrils and enlarged laryngeal saccules, which, according to the American College of Veterinary Surgeons, consist of tissue found in front of the vocal cord that gets pulled into the windpipe and partially obstructs the airway. The chow is also predisposed to pulmonic stenosis, a heart defect commonly reported in this breed, known for narrowing the pulmonary artery and causing difficulty breathing, abdominal enlargement, fluid retention, abnormal heart rates, exercise-induced fainting and even sudden death. Other causes of possible breathing problems may include an allergic reaction, exposure to irritating materials, trauma, an underlying heart condition, overheating, or an infection caused by viruses, bacteria, fungi or parasites and many more. When a dog is at rest, the normal respiration rate is around 10 to 35 breaths per minute with the average dog taking 24 breaths a minute. A respiratory rate that is persistently high or has decreased markedly are signs of potential trouble. See your vet immediately if your chow's breathing appears labored or if he's panting excessively, snorting, snoring, coughing, rasping or if you notice a change in voice. Abnormal breathing may signal an emergency that warrants an immediate veterinarian visit.